Netgear Nighthawk X6 AC2200 Tri-Band WiFi Mesh Extender with Patented FastLane3 Technology boosts your WiFi to super-fast speeds up to 2.2Gbps. 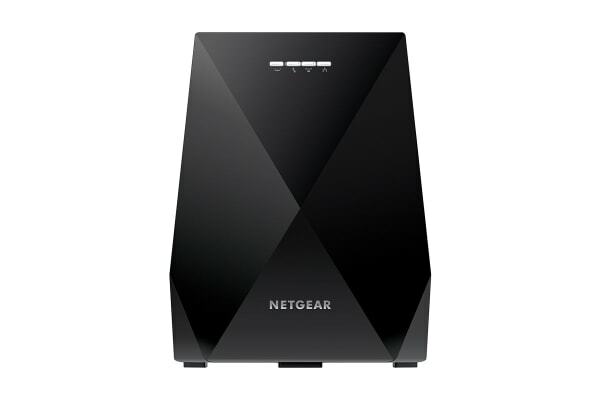 The Netgear Nighthawk X6 AC2200 Tri-Band WiFi Mesh Extender creates powerful whole home WiFi using your existing WiFi. EX7700 is one of the most advanced tri-band WiFi mesh extenders that includes two dedicated 866Mbps 5GHz bands for extending Internet speeds to your devices. Dedicated WiFi Link avoids cutting the extended WiFi bandwidth in half. Smart Roaming intelligently connects your mobile devices to the optimal WiFi for superior streaming as you move around your house. Use the same WiFi name and password to provide seamless connectivity as you roam throughout the house. Secure Boot ensures that only NETGEAR signed firmware can run on the device. It detects tampering with boot loader and kernel by validating their digital signatures. The NETGEAR patented FastLane3 Technology is comprised of Tri-band WiFi that creates a dedicated WiFi link between the extender and router and an optimized antenna design in the extender, giving you more speed to more devices. These combined elements create a powerful solution to extend WiFi throughout your home. How strong is your WiFi signal? Use the NETGEAR WiFi Analytics app and get advanced analytics to optimize your existing or newly extended WiFi network. Check your network status, WiFi signal strength, identify crowded WiFi channels & much more!